The line of herbal supplements of Blessed Herbs provides a good way to cope with menopausal symptoms unique to each individual. It provides relief and comfort and re-establishes the body’s healthy balance. 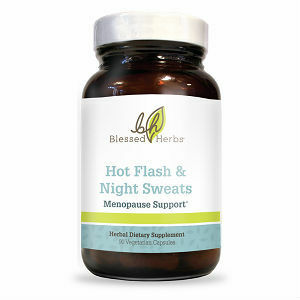 Hot Flash & Night Sweats – eases hot flashes and night sweats by regulating the body temperature and replaces natural hormones with balanced plant estrogens and flavonoids. Hops – Humulus lupulus contains active plant compounds such as humulone and lupulone which help calm frazzled nerves. Hops have been utilized to promote your body’s healthy response to insomnia, letting you get back to sleep – instead of suffering through late-night symptoms of menopause. Black Cohosh – One of the oldest staples of herbal feminine health remedies, Actaea racemosa contains the isoflavone “formononetin” a phytoestrogen compound that can bind to estrogen receptors, mimicking your body’s healthy, balanced response to the hormone. Alfalfa – Medicago sativa astringent herb that promotes both a healthy cooling feeling and circulatory response, Alfalfa is also loaded with healthy minerals like calcium, potassium and magnesium to support healthy bone density during menopause. Sage – Salvia officinalis supports a strong anhidrotic (anti-sweating) response in your body, cooling your entire system and promoting feminine health at the same time. Hot Flashes & Night Sweats uses only water-extracted Sage to limit your body’s exposure to Thujone Oil. Balanced Mood – helps balance the nervous system, reduces the effects of stress and promotes a happier mood. Dandelion – Helping to boost your body’s receptiveness to other herbs, Dandelion also supports natural detoxification by promoting liver health. Black Cohosh – Black Cohosh is the staple of herbal menopausal relief remedies. Black Cohosh contains the isoflavone “formononetin,” a phytoestrogen compound that binds to estrogen receptors, mimicking estrogen’s effects. Blue Vervain – Used for medicinal purposes since classical antiquity, Blue Vervain eases tension and supports a healthier mood. Eleuthero – Another adaptogen, Eleuthero also aides the body’s adrenal glands as well as the natural detoxification process. Lavender – Lavender gets its name from the Latin “lavere” meaning “to wash.” Most known for its pleasant scent, Lavender promotes a natural, soothing effect when ingested. Ashwagandha – Cultivated in regions of India as well as Nepal, Ashwagandha is known as “the Indian Ginseng” and acts as an adaptogen, a substance that helps the body cope with daily stress. Passion Flower – Believed to increase GammaAminobutyric Acid (GABA) levels in the brain, Passion Flower promotes anti-anxiety effects, without drowsiness. Feminine Comfort – helps restore sexual vitality and response by easing vaginal dryness and discomfort. Dandelion – Helps promote liver and digestive health + your body’s natural ability to utilize other herbs. Red Clover – Red Clover blossoms have been shown to promote a healthy immune response and support skin health. Licorice Root – Your liver and surrounding organs play a major role in your menopausal transition. Licorice root aides your liver and surrounding organs in the natural detoxification process. Black Cohosh – Black cohosh is a reliable mood mender for irritable women whose sleep is broken by night sweats. In human trials, black cohosh has been shown to improve how women feel. Tribulus – One of the best-studied plants in contemporary scientific trials, Tribulus terrestris, finds that this wasteland weed tops the many other herbs known to improve lubrication – and does it safely. It also promotes healthy levels of estrogen and DHEA within your body. Shatavari – Common to Sri Lanka, India and the Himilayas, Shatavari supports the body’s natural lubrication process by promoting the restoration of mucus membranes within the uterus. Alfalfa with Chia Max Omega-3 – promotes a healthy response to inflammation and supports proper circulation. Women’s Rebalancing Cleanse – purifies the whole body – including the organs that support the reproductive system. Burdock Root – Burdock Root’s phytoestrogen content promotes your body’s natural estrogen-like response, making it the “MVP” of the Blessed Herbs Women’s Rebalancing Cleanse formula. This herb helps purify as well as detoxify your blood and also contains inulin, a natural fiber traditionally used to improve digestion. Fenugreek – Fenugreek has several medicinal properties. Fenugreek helps restore your body’s healthy digestive function, and is considered an excellent addition to “bitter” remedies and as a carminative herb. Marshmallow Root –Native to Europe and western Asia, Marshmallow root contains the amino acid Asparagine, and utilizes naturally-occurring mucilage to help absorb your body’s toxins and coat your intestinal tract. Triphala Fruit – A staple in Ayurveda traditions, Triphala is rich in nutrients such as vitamin C. Triphala is known as a cleansing agent, and is thought to promote a healthy digestive response and toxin cleansing in your body. Indian Gooseberry – Also known as Amla fruit, Indian Gooseberry is rich in polyphenols and flavonoids that help your body’s natural defenses flush toxins from your body. Amla is an excellent source of antioxidants, vitamins and minerals as well. Kudzu Root – This tenacious, roadside herb common in the Southeastern United States contains isoflavones like Daidzein, Daidzin, and Puerarin. Kudzu also functions as an antioxidant and promotes a healthy inflammatory response. The separation of products for the relief of each unique symptoms of menopause may have an advantage if the individual is only suffering one kind of symptom, that way she is able to save herself from buying the other line of products the Blessed Herb is offering. But if she is experiencing multiple symptoms then this product is too expensive. Jackie Horowitz	reviewed Blessed Herbs	on October 10th	 and gave it a rating of 2.5.